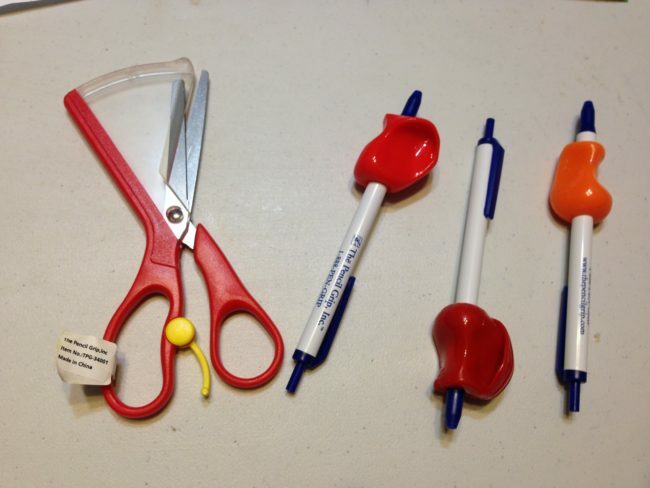 I am excited to tell you about The 3 Step Pencil Grip Training Kit and The Ultra Safe Safety Scissors from The Pencil Grip, Inc. 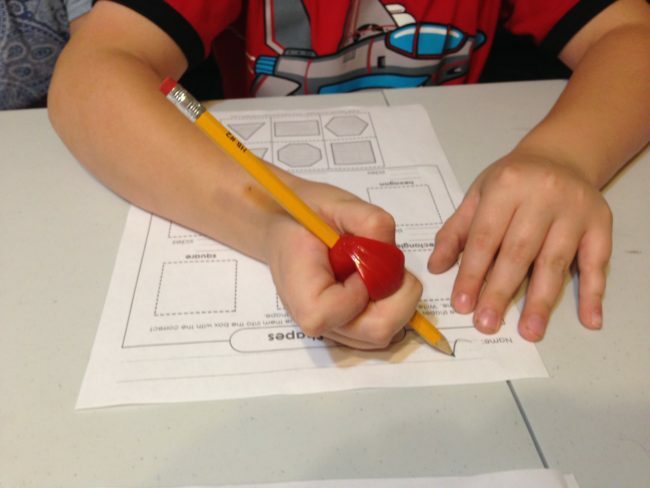 The Pencil Grip, Inc. is a world renown company and a leading manufacturer of ergonomic writing aids and therapeutic toys and educational products. They have lots of wonderful products that benefit both kids and adults. They have built a reputation with parents, teachers, and therapists worldwide who have used these products and believe in the value of the product and methods applied. 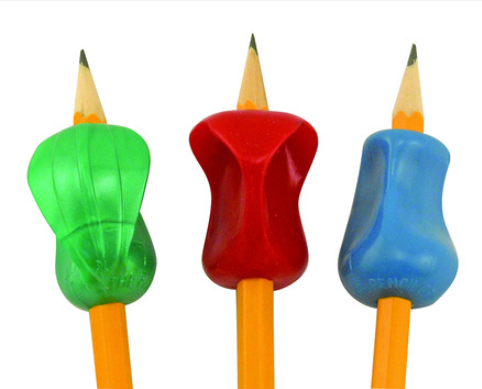 The Pencil Grip, Inc. specializes in unique products that have many applications. 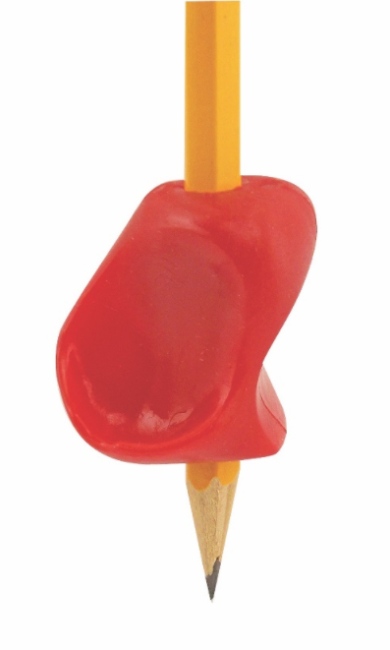 The Pencil Grip, Inc. company was created by educational therapist Dr. Lois Provda in 1992. Their products have many decades of successful use in homes, pediatric therapy, occupational therapy, and classroom settings. The company has grown into an irreplaceable resource for unique and innovative products. 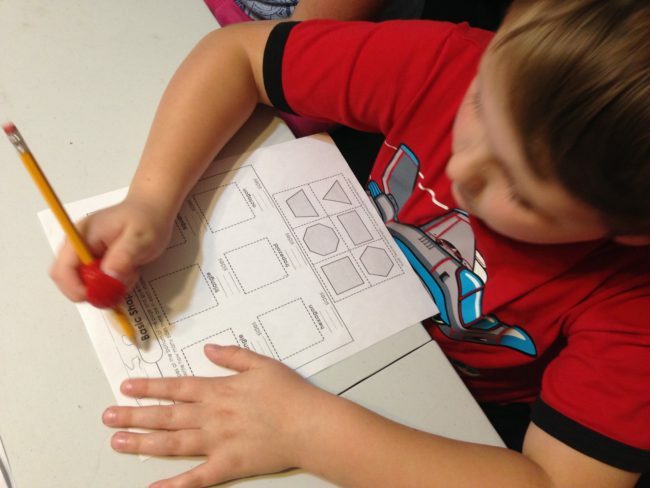 This kit is recommended by doctors and therapists for both left handed and right handed children and adults. By using the three step method, folks are able to reduce their frustration and strain. 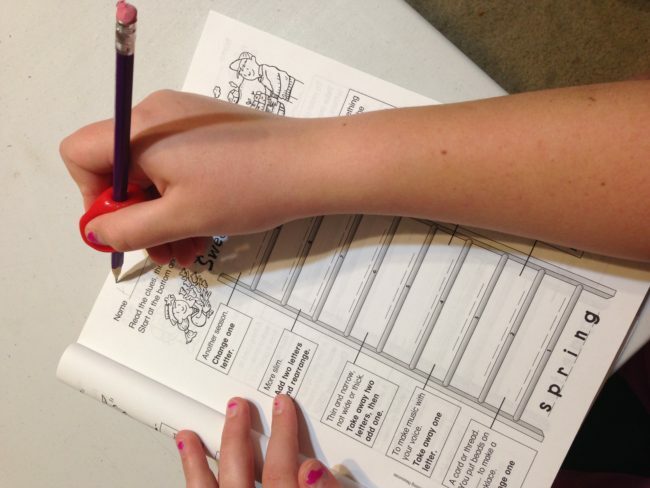 They also reduce the normal time needed to learn (or re-learn) how to hold a pencil (or pen) correctly when writing. These products help correct hand position, dexterity, and reduce stress on the hands and knuckles. They help control the grip of the writing instrument and improve performance. 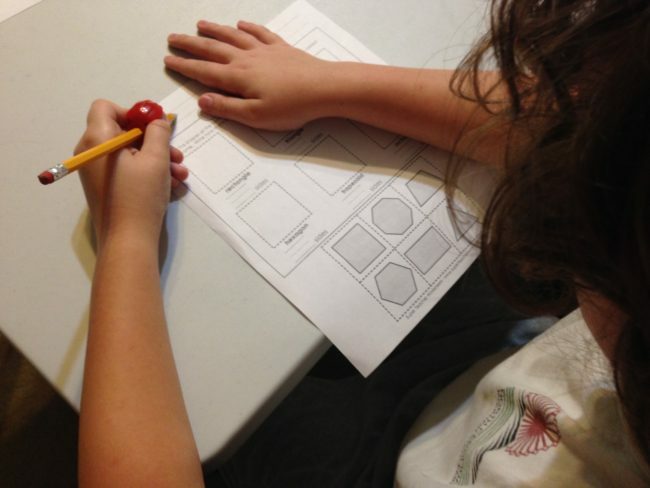 A free instructional poster is available on The Pencil Grip website. 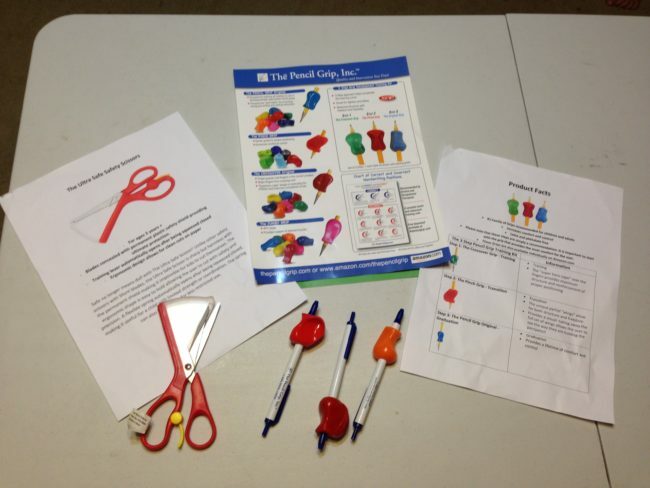 These products are fun and easy to use and help motivate hesitant learners too. Step 1: The Crossover Grip is used for training. It has a “super hero cape” design built in. The cape is over the finger design provides the maximum reinforcement of correct position and structure. When I worked with my five year old on using this grip, he kept wanting to put his middle finger in the wrong postion, placing it below the grip instead of behind it. After a few times of reminding him, I was able to get him to hold it correctly and he felt more control and did very well with it. I also had my eight year old try out using this grip. He liked the feel of it. I tried him on the next grip in the kit and he preferred the first grip more. Perhaps it is the “super hero cape” on this grip that he is excited about. He is left handed and sometimes it can be challenging to write going forward rather than write sliding the hand backward across the paper as right handers do. 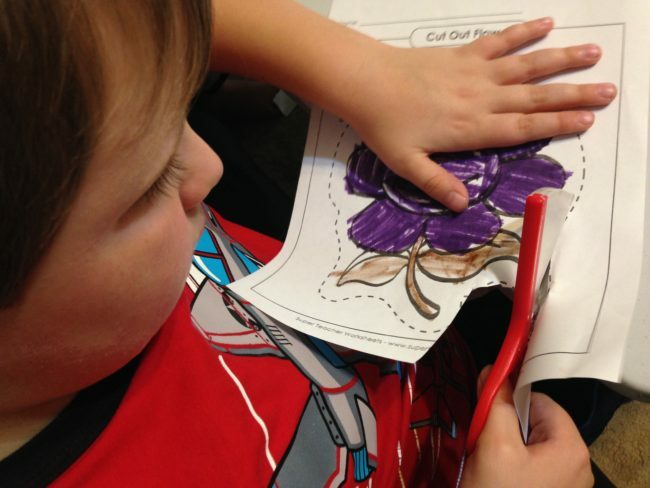 This grip feels comfortable to him and right away we noticed an improvement in his control. So he will be using this one for a bit longer until he is ready to move forward. Step 2: The Pinch Grip is used for Transitioning. It has wings. The wings help the user to see their grip and allows both freedom in writing and also more structure. Since my younger sons weren’t ready to move on to the next grip in the kit just yet, I used the Pinch Grip with my daughter after she tried out the Crossover Grip first. This was the perfect grip for her. 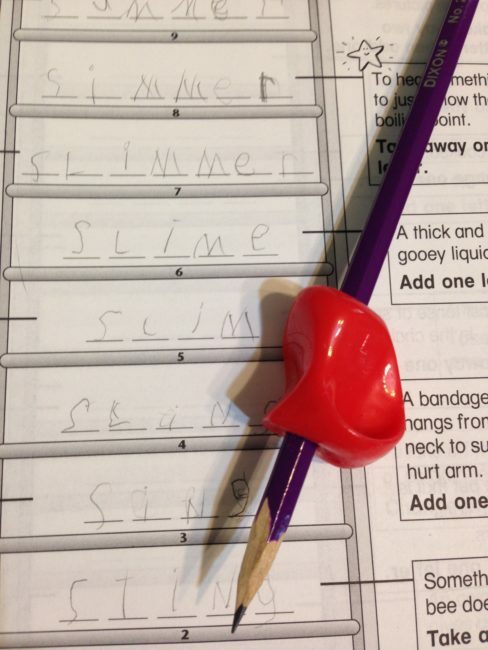 For some reason, she liked to push the grip up higher on her pencil though. I kept bringing it back down for her, but she said she liked using it up higher. 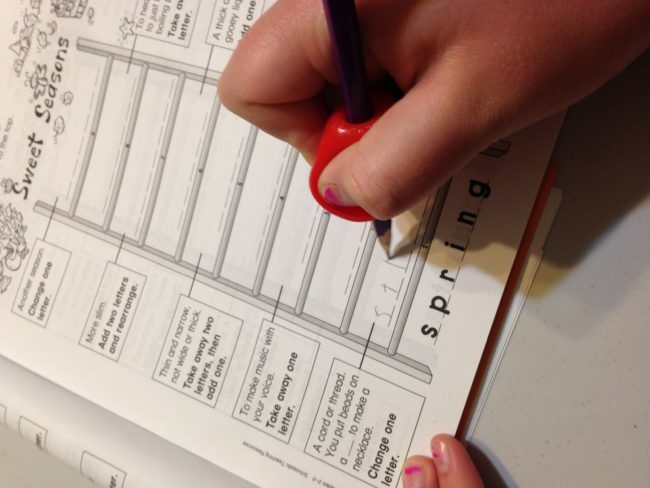 I noticed improvement in her control of the pencil right away. Step 3: The Pencil Grip Original is the Graduation phase. It provides ongoing comfort and control and assists the user in continuing what they have learned. My older boys and I tried out each grip in the kit. The Original Grip was the most comfortable for me. It is soft and gave me very good control and felt natural between my fingers. I found this informative video online that explains the many benefits of using various kinds of pencil grips. 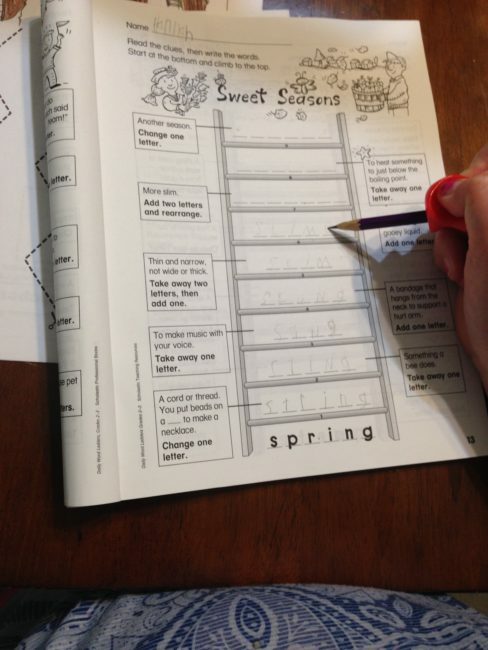 The video is not from The Pencil Grip company however, it is informational and gives credit to Dr. Lois Provda from The Pencil Grip, Inc.
With the 3 Step Pencil Grip Training Kit, I am certain our family will see improvement in their writing. As each person works their way through the series of grips, they will be able to write with more control, less wobbling and produce straighter and neater lines. 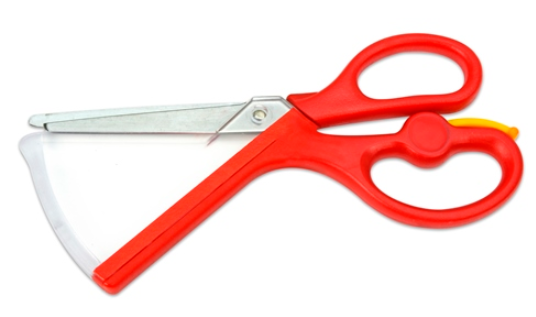 These scissors are sharp and cut cleanly with precision. They have sharp blades that are covered with a permanent shield to prevent kids from cutting themselves. They are easy to hold thanks to their ergonomic design. They have a spring assist opening feature that helps those with limited abilities, but can be folded in for less restricted use. 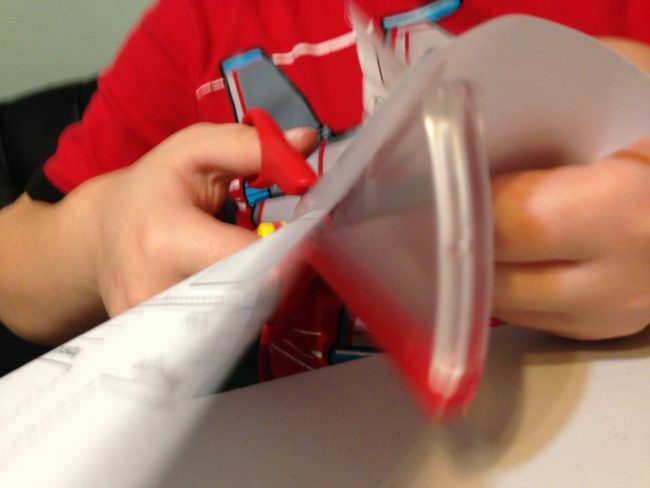 My 5 year old son and I both used these scissors for the purpose of this review. 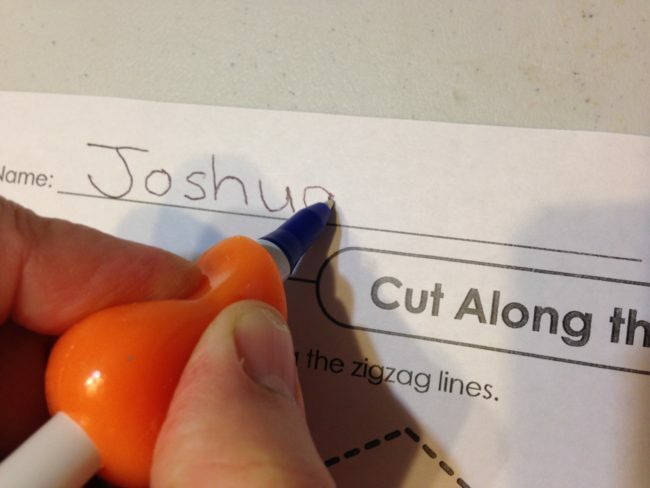 To use the scissors you have to place the paper in a very small space between the plastic guard and the top blade. It feels a little awkward at first. But eventually you get the hang of it. 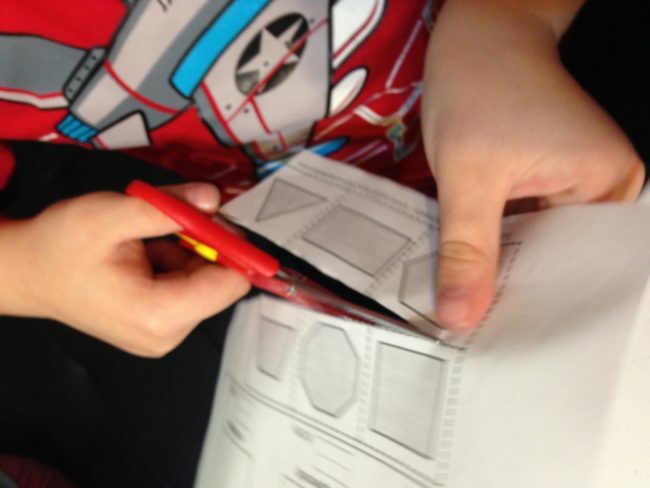 The blades are very sharp and cut easily through paper. But you don’t have to worry about cutting fingers because a finger cannot fit into the tiny space between the guard and the top blade. 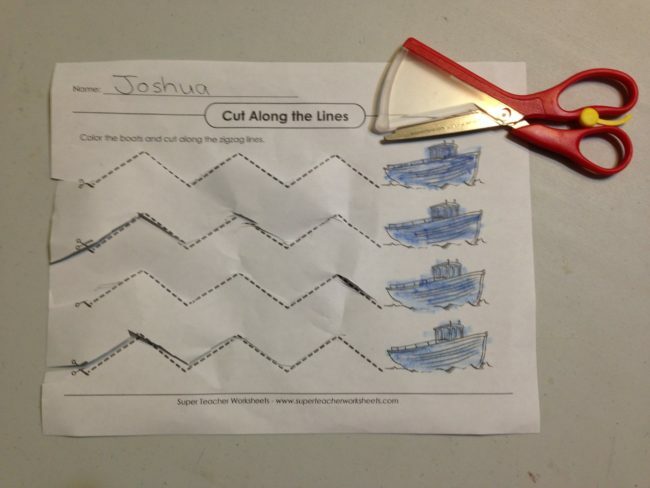 He was able to cut straight lines, curved lines, and zig zag lines too. 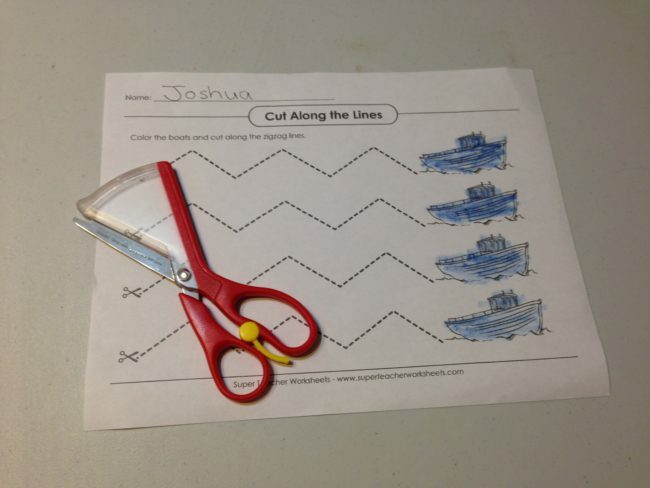 It was a good feeling knowing his fingers were safe and he can use these scissors independently. I definitely needed these when he was younger and needed some protection from injury. Thankfully, he has better coordination now, but I still keep scissors put up and he only uses them with supervision. Now with these Ultra Safe Safety Scissors, I will be able to leave them in his supplies for him to use at anytime and I won’t have to worry. 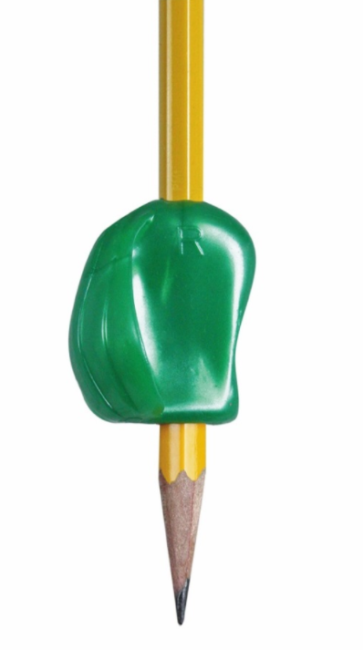 We have enjoyed using these products from The Pencil Grip. This is our second time to review a product from them and their products are well made and definitely beneficial for all ages. 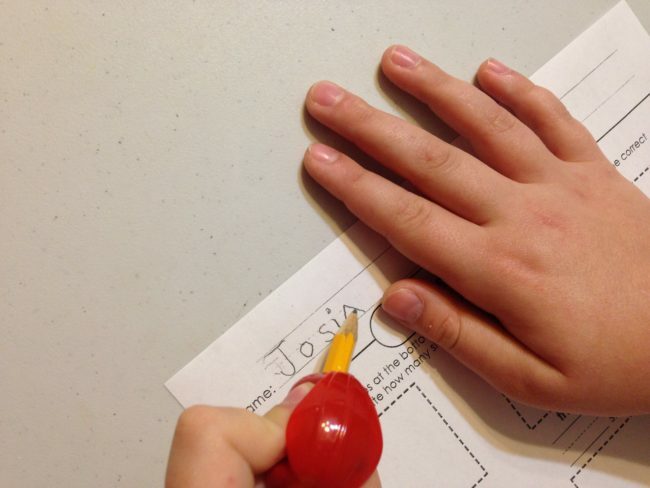 Be sure to check out what others on the Homeschool Review Crew had to say about using products from Pencil Grip, INC in their home. 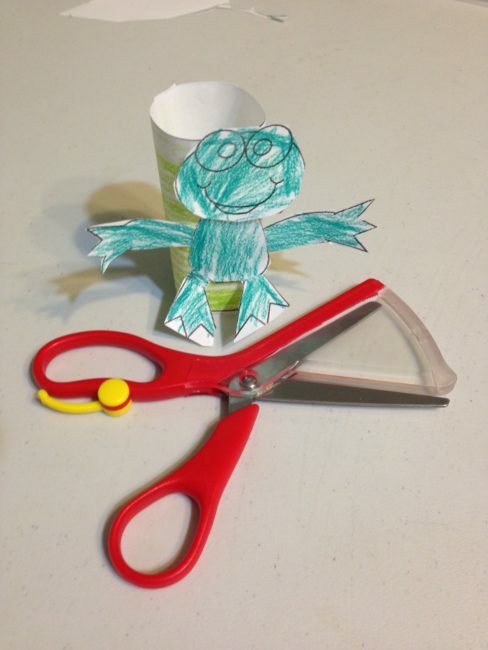 This entry was posted in The Pencil Grip, TOS Crew Reviews and tagged Children’s scissors, Kids school supplies, Kids supplies, Pencil Grip, preschool supplies, Safety Scissors, Safety scissors for kids, school supplies, Scissor safety, Writing on October 19, 2017 by Melinda Weiser.